ATHENS, December 6. /TASS/. Greece is conducting dialogue with the European Union on the extension of TurkStream across Greek territory to other EU countries and has strong arguments, Greek Prime Minister Alexis Tsipras said in an exclusive interview with TASS First Deputy Director General Mikhail Gusman ahead of his visit to Moscow on December 7. The prime minister highlighted that energy cooperation is a very important sphere in Greek-Russian relations. "We value that Russia is an important partner in the energy sector, as it has rich energy sources," Tsipras said, adding that Greece has pursued the multi-faceted energy policy since 2015, when he headed the government. In his opinion, Athens and other European countries are convinced that the European Union has to move to cooperation with the Russian Federation on the TurkStream pipeline - which, according to Greece, should become not only TurkStream, but "EuroStream" as well - as part of the multifaceted policy in the energy sphere. 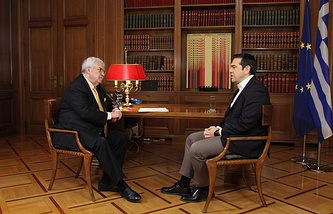 "We are negotiating [it] in the European Union," Tsipras said. "I believe that our arguments are strong. We have persistence and patience, and I believe that possibly we will have positive results in the future." Gazprom started building the sea part of the TurkStream gas pipeline in May 2017. The construction ended on November 19, 2018. The 930-km-long pipeline goes along the bottom of the Black Sea to the Turkish shore. Then a 180-km-long land transit branch to the Turkish border will be built. The launch of the second branch of the TurkStream to deliver gas to Southern and Southeast Europe was scheduled for 2019. In November, Tsipras stated that Greece is actively agitating for this gas pipeline to pass through the Greek territory to Europe.